Following the publication of HS2’s latest revisions to the route they are visiting Woodlesford for two days to answer our detailed questions. Whether you are impacted by the viadcut, tunnels or the maintenance depot, this is your opportunity to press HS2 for answers, to understand where the construction traffic will pass, and where the construction compounds will be located. The formal Public Information Event is Wednesday 4 July 2018 from 2pm to 8pm at the Oulton Institute. HS2 will also be holding a drop-in surgery on Thursday 5 July 2018 from 3pm to 8pm also at the Institute. You can also book, via their helpdesk, one to one meetings to discuss your concerns in detail, in private, at the Institute on either day. HS2 are also using the opportunity provided by the events to host a series of one to one appointments with those who are directly affected by the line of route and associated works. The purpose of these meetings is to understand as early as possible the impacts of the scheme on affected parties’ property to better inform the development of our design and any possible mitigations. HS2 Ltd will be holding a series of community information events in June and July 2018 to demonstrate how the plans and designs for Britain’s new high speed railway between the West Midlands and Leeds and Crewe and Manchester are developing. The Government confirmed its preferred route for Phase 2b of the High Speed Two (HS2) railway on 17 July 2017. Achieving this significant milestone has enabled us to spend the last ten months progressing our early design and construction proposals. We’ve spoken to many organisations over that time, and these events allow individuals to come and talk to us about our evolving designs in a community setting, which is really important as local knowledge has a crucial role to play in informing the final design and construction proposals for the new railway. We’re eager to share our updated plans and designs and to talk to people about our proposals, and the benefits that HS2 will deliver to them and their community, ahead of the public consultation later this year. The 30 drop-in events across the route will be attended by HS2 employees and contractors with expertise in a wide range of fields including engineering, environment, and land and property. We will write to everyone living within 1km of the route and members of the public are encouraged to attend so they can review the plans and talk to the team about the emerging designs and understand what this means for them We would encourage you to promote the events through your own networks and channels to spread the message to all those whom may have an interest. Your help in supporting attendance is much appreciated. We are also using the opportunity provided by the events to host a series of one to one appointments with those who are directly affected by the line of route and associated works. The purpose of these meetings is to understand as early as possible the impacts of the scheme on affected parties’ property to better inform the development of our design and any possible mitigations. We are writing to all parties directly, inviting them to make an appointment at their nearest event. We appreciate that the introduction of new information about how we plan to build and operate the railway presents new and different impacts for those who live and work in the area. This entry was posted in Uncategorized on June 21, 2018 by Latest News. The Guardian would like to hear from individuals, communities and businesses affected by the planned route of HS2. The HS2 rail link will affect many people in regions all along the proposed 140 mile route, with plans that will demolish properties, close businesses and indelibly alter landscapes by its proposed path. The Guardian would like to hear what the impact will be for you. This entry was posted in Uncategorized on November 3, 2017 by Latest News. Demand that HS2 be completely tunnelled through our area to protect our green setting and avoid all the problems associated with a decade of construction. The mainline viaduct will destroy the Aire Valley – Oulton and Woodlesford will never be the same again. Sign our petition and ask you family and friends to do the same, wherever they live. This entry was posted in Uncategorized on October 28, 2017 by Latest News. This entry was posted in Uncategorized on October 19, 2017 by Latest News. The consultation on the depot closes on Thursday evening. Act now to raise your objections to HS2. It is important that as many people as possible submit a response. We need everyone to object to the current proposed route and viadcuts through our area to demand that both the mainline and branch line are tunnelled completely to mitigation the blight on our villages. Demand it go UNDER NOT OVER! Be sure to include your full name and address if sending by email. Seeks views on the proposed relocation of a rolling stock depot from New Crofton to a site in the Aire Valley adjacent to the M1. 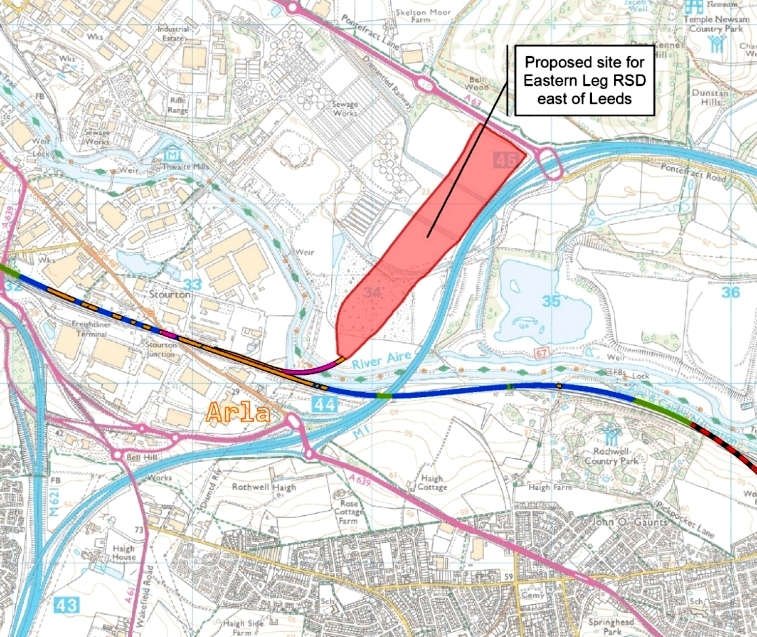 Do you support the proposal to locate the Eastern Leg RSD on a site east of Leeds in the Aire Valley adjacent to the M1? Please indicate whether or not you support the proposal, together with your reasons? Whilst this question is specific to the Rolling Stock Depot (RSD), it is also important to feedback our views on moving the tunnel entrance away from the village, to before the M62, and replacing the viaduct by COMPLETELY tunnelling both the mainline and branchline. 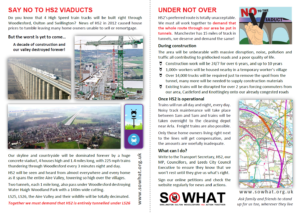 As a community if HS2 has to go ahead, it needs to go under and not over. This objection can be added as additional comments to the online response, or in the email sent as part of the consultation. Below are suggestions on what to include, but please feel free (and we encourage all) to put your own stamp on any response. Please share with friends, family, neighbours, and colleagues to ensure as many people respond as possible. Please write in your own words. It is important that everyone responds, there CAN be multiple response per household, one for each person. I have huge concerns over the level of disruption caused during construction of the depot. The postcode of LS26, and surrounding areas is already going to face unprecedented blight with the construction of the main and spur lines going through Woodlesford, and up through Swillington, and Garforth. The new addition of the rolling stock depot will increase this even further. The transport infrastructure for the area is already not suitable for all the construction traffic that would be needed just to build the lines that have been proposed. Adding this depot to the area just compounds this huge issue further. I understand part of the reason this was moved from near Crofton on the original plan was due to the level of blight it was going to cause to that area due to it being surrounded on 3 sides by the new lines and then the RSD. This is now the case for Woodlesford / Swillington, as we have the mainline, spurline, and RSD to the north. Why if this is unacceptable for one area, is it acceptable for ours? I assume traffic in and out of the new depot will be 24/7/365? Impact on nearby villages needs to be mitigated and routes prescribed for motorway is closed. Consideration is required for the compound effect on roads due to the depot and the proposed park and ride at Stourton, this needs to be fully assessed and mitigated. I would like confirmation on any additional impact on the Woodlesford train line closure during construction. At present no closure timeline has been given for during construction of the main HS2 line, I assume this will increase closure time? What will be the number of train movements per day, and what times of the day will they happen? Are there any specifics on noise and light pollution that can be given based on how HS2 know these type of depots operate? Additional comments to add to your response on Under Not Over! Other areas of the route have significantly more tunnelling being completed, and proposed. In order to limit blight on LS26 and the surrounding areas I would like to see the proposals updated to have both the main line, and branch line (that comes across the M62, past Clumpcliffe, towards Woodlesford, and then spurs off up to Swillington and beyond, with the main line going under Woodlesford) to be entirely tunnelled through our area. There should be no gigantic viaducts cutting towards, past, and alongside all the residential areas as has been proposed already. The additional blight on top generated from the new RSD on top of the huge scale of blight the area already has proposed, should have this additional tunnelling to at least provide some compensation. This entry was posted in Uncategorized on October 10, 2017 by Latest News. Have your say before it’s too late! This entry was posted in Uncategorized on September 16, 2017 by Latest News. This is your chance to drop in and examine their latest plans for our area and the proposed depot near Arla. Make the most of this opportunity to express your views on their plans! Demand more and longer tunnels, instead of the huge viaducts, to remove the blight to our valley. If they tunnel both the Leeds branch line and main line from the M62 it would avoid all the destruction and protect our green setting. Oulton & Woodlesford Neighbourhood Forum will also be in attendance. The current HS2 proposed route will destroy our area. Don’t let this happen. There are better alternatives. HS2 must tunnel the entire section through LS26 on both the branch and main lines. Go have your say. Find out about the consultations and send them your written objections. This entry was posted in Uncategorized on August 19, 2017 by Latest News. HS2 recently announced plans for a maintenance depot opposite Arla and next to the M1. This will clearly need connectivity to the HS2 tracks and is likely to cause further disruption to local rail services while these connections are made and realignment takes place. There are currently no estimates as to the severity or period of disruption anticipated. The depot will be operational 24 hours a day. A consultation on the proposed depot is currently open and runs until 12 October 2017 – raise your objections and concerns now! This entry was posted in Uncategorized on August 1, 2017 by Latest News.